When The Bungalow (now The Old Bungalow Guest House) was taken over by Gary and Hannah Smith in 2008, one of the tasks on the top of their list was to get the existing website re-designed. 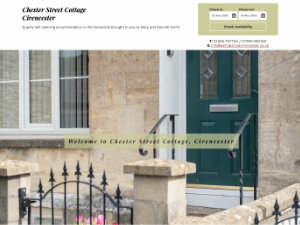 We had previously created a website for Gary when he owned a pub in Cirencester, and he came back to us to re-design the B&B's website. We worked with Gary to create a new website, and visited the B&B to take up to date photos of the bed and breakfast using a special wide angle lens to capture as much detail on photo as was possible. In a story similar to The Old Bungalow above, when new owners took over The Ivy House Bed and Breakfast in 2008 they came to us for a website re-design. The previous owners of The Ivy House had explained to the new owners that we looked after the websites of most of the B&Bs in Cirencester as well as two town centre hotels. We worked with the new owners to create an updated, but simple, new website to their own design.